No doubt, India is full of incredible sights, stories and spots from Kashmir to Kanyakumari. But, what is the most incredible about India? The Kumbh Mela – the confluence of religious faith, cosmic energy, ethereal power and divine love on earth. Also known as Magh Mela, this religious festival of India is believed to be as old as the universe itself. A whopping 15 million visitors are expected to turn up at the ongoing Kumbh Mela 2019 at Prayagraj (Allahabad), Uttar Pradesh. The state government of Uttar Pradesh allocated INR 4200 crore for Kumbh Mela 2019, which is over thrice the budget for the Maha Kumbh 2013. It is expected that the economic activities to be taking place over the 50 days will generate a whopping revenues of INR 1.2 lakh crore and create employment for over 6 lakh workers in various sectors. The budget of Kumbh 2019 is six times more than the Rs. 720cr Isha Ambani wedding in December 2018. Maha Kumbh Mela 2019 at Prayagraj sprawls over 3,200 hectares, twice the size of the area allocated to the previous Kumbh events. Allahabad City has undergone a massive infrastructure overhaul, which includes the upgrading of nine railways stations and the construction of a new airport terminal. More than 4,200 premium tents have been setup across the fairground, and 40,000 street lights have been installed across the city. The state government has installed 1, 22,000 eco-friendly toilets for the convenience of millions of pilgrims. A new 100-bed central hospital has been set up to attend to emergency medical needs of devotees. The hospitality sector is reported to have employed 2, 50,000 people, including 150,000 jobs in aviation. 45,000 jobs have been generated for tour operations. The number of employment opportunities in eco-tourism and medical tourism is nearly 85,000. In addition, another 55,000 new jobs have been created in the unorganized sector for tour guides, taxi drivers, interpreters, volunteers, etc. to make a living during Maha Kumbh 2019. The festival will have created 600,000 jobs until a few weeks following March 4, according to Fortune India. Evidently, it is not just difficult but impossible to imagine the gigantic proportions of Maha Kumbh 2019 unless you travel on cheap last minute flights to India and visit the event in person. There are many interesting things to know about Kumbh Mela, beyond the budget of Maha Kumbh at Prayagraj this year. We at Travel Beats, an overseas Indian community portal by Indian Eagle Travel, mined some amazing and lesser-known facts about Kumbh Mela from 640 AD to the present. The origin of Kumbh is associated with the mythical story of Samudra Manthan, a massive sea exploration on earth by the Devas and the Asuras in the divine era of India. A pitcher filled with amrita, the elixir of immortality, came out of the core of the sea during the exploration. 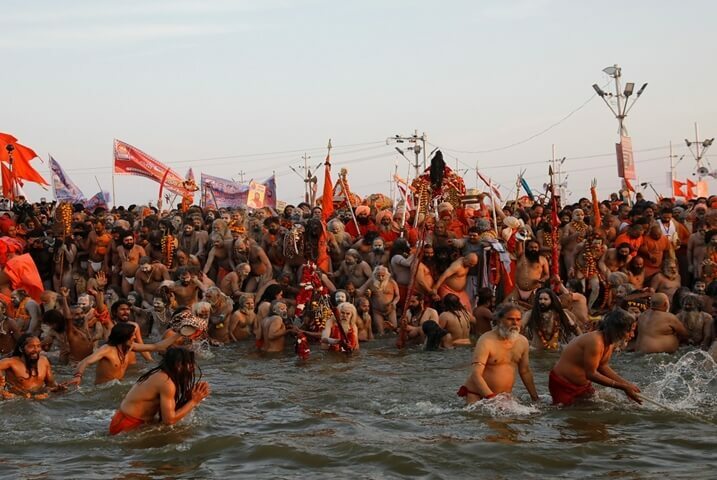 When the Devas and the Asuras, driven by a desire to be blessed with immortality, got into a clash over the pitcher, four drops of amrita fell at Prayag (Allahabad), Haridwar, Ujjain and Nashik which became the venues of Kumbh Mela. 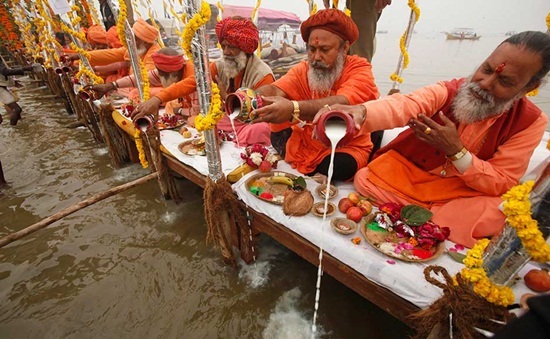 The most spectacular ceremony to behold during the festival is ritual bathing on the banks of the holy rivers – the Ganga in Haridwar, the Kshipra in Ujjain, the Godavari in Nashik, and the Sangam where the Ganga, the Yamuna and the Saraswati get merged in Allahabad. It is believed that each of these rivers turns into a pitcher of amrita (nectar) on different days of the festival – Makar Sankranti, Paush Purnima, Basant Panchami, Rath Saptami, Mauni Amavasy, and Bhisma Ekadeshi. This religious fair is held over a sprawling area of 50.83 square kilometers. 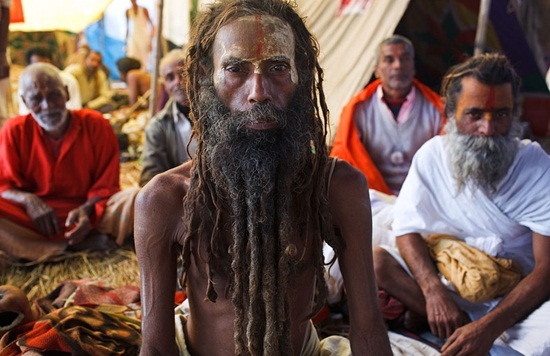 The premise of the Kumbh Mela is 200 times larger than the Vatican City of Rome, the smallest country in the world. Such a large number of sadhus (hermits) visit Kumbh Mela 2019 that it won’t be unjust to call it the fair of sadhus. Several groups of sadhus from every nook and corner of India travel all the distance to take a holy dip into the sacred rivers during the festival. The Nagas who stay naked from head to toe, the Parivrajakas who do not speak a single word to pursue absolute silence, the Kalpavasis who take bath at three different times of the day, the Urdhwavahurs who believe in severe austerity, and the Shirshasins who meditate for long hours while standing on their heads. If the clock is set back, we find a reference to the number of devotees at Prayag Kumbh Mela, in the writings of Hiuen Tsang, a historic traveler from China, who visited India during the regime of Harshavardhana in 640 AD. Hiuen Tsang mentioned in his chronicle that the Kumbh Festival had fetched 5 million footfalls to Prayag in 640AD when Indian population was around 6 crore. Impressed with the colossal dimensions of the Kumbh Mela 2019, Harvard University is looking to take on it as a case study. The researchers at Harvard University are interested in studying the economics behind the festival and analyzing the statistics of its evolution. Mark Twin, a famous American writer, visited India during the Kumbh Mela in 1895. He was so overwhelmed to see the practice of austerity by millions of Indians including the young and the old, the strong and the frail, the rich and the poor traveling from remote corners of the country that he called it the wonderful power of a faith beyond imagination. There is a great demand for mud and cow dung among the devotees during the festival. The sale of these natural commodities goes up with the festival reaching its peak. It is a golden opportunity for money-making individuals to make a quick buck by selling mud and cow dung at unreasonable prices. Kumbh Mela has got many nicknames for its fame spread far and wide across the world. The most popular are the largest pilgrimage on earth, the world’s biggest fair, and the greatest show on earth. So huge is the rush of people traveling to Allahabad for the Prayagraj Kumbh 2019 is that Indian Railways extended the window for buying unreserved train tickets up to 15 days. Hundreds of special trains are running to and from Allahabad. Even, thousands of tickets have been booked for last minute air travel to India from USA, Australia, Europe and the Middle East. “We have been receiving an influx of calls with booking queries for cheap flights tickets to India for Kumbh 2019. It’s overwhelming!” exclaimed the chief travel economist of Indian Eagle.